With 2,310,185 cars sold in 2018, Mercedes-Benz is the best selling premium brand in the automotive industry for the third time in succession. BMW is almost 185,000 cars behind, while Audi sold 500,000 less cars than Mercedes-Benz in 2018. Despite challenges for the entire industry and following the introduction of the WLTP Norm, Mercedes-Benz posted the eighth consecutive record year for Mercedes-Benz. With 2,310,185 units delivered in 2018, Mercedes sales has increased again with 0.9%, making Mercedes-Benz the best selling premium brand in the automotive industry for the third time in succession. The new sales record was driven in particular by the success of Mercedes-Benz in the Asia-Pacific region and its core Chinese market there. The Asia Pacific region is the only region in the world where Mercedes-Bens has registered sales increase. 943,473 units were sold in the Asia-Pacific region, which represent 7.8% more than ever before in one year. China is the biggest sales market worldwide with 652,996 cars sold last year. Mercedes-Benz is the only premium manufacturer which sold more than 600,000 cars in China in one year – a milestone reached already in November 2018. 933,697 cars were sold in Europe from which 303,862 in Germany (+0.1%). The SUVs, S-Class saloon and the new A-Class recorded the highest growth in Europe. In the Nafta region, 378,013 units were handed over the customers in 2018 and despite the 5.6% decrease in sales, Mercedes-Benz continued to be the best selling premium brand in the NAFTA region in 2018. With 820,721 units sold (+1.9%) the SUVs made a significant contribution to the sales success of last year and accounts for more than a third of all Mercedes-Benz sales. The best selling SUVs were the GLC and the GLA. Every fourth car sold was a compact car. 609,000 customers worldwide received their new A-Class, B-Class, CLA, CLA Shooting Brake or GLA. The new A-Class recorded global growth of 3.4% in 2018. On the other hand, the C-Class is the highest volume Mercedes-Benz model with 397,000 units sold in 2018 (sallon and estate). The long wheelbase version of the C-Class saloon which is built and sold exclusively in China set a new record with a double digit growth. The S-Class saloon is still the best selling luxury saloon in the world with 77,927 units sold while the top versions Mercedes-Maybach S-Class registered a new record with a sales increase of 21.8%. The V-Class set a new record with 62,699 units sold while the new Mercedes X-Class found more than 14,000 clients in 2018. Mercedes-AMG sport division sold 118,204 vehicles in 2018 being the leader of the premium sport market. BMW has announced that BMW Group is the world’s leading premium automotive company in 2018, because the bavarians has cumulated the BMW sales with Mini sales. 2,490,664 (+1.1%) BMW, Mini and Rolls-Royce were delivered in 2018. BMW brand itself delivered 2,125,026 cars, almost 185,000 cars less than Mercedes-Benz, despite a 1.8% sales increase in 2018. As in case of Mercedes-Benz, BMW registered the best results in the Asia Pacific Region but Bavarians continue to publish the sales data by regions only for the whole group and not by brands. Even so, BMW has sold in total less BMW and Minis in the Asia Pacific region then Mercedes-Benz brand. In NAFTA region, BMW was the only premium brand which registered a plus in 2018 with 1.4%. By models, the SUVs accounted 37.3% of total BMW sales which means 792,635 cars. Another significant growth came from the BMW 5 Series. 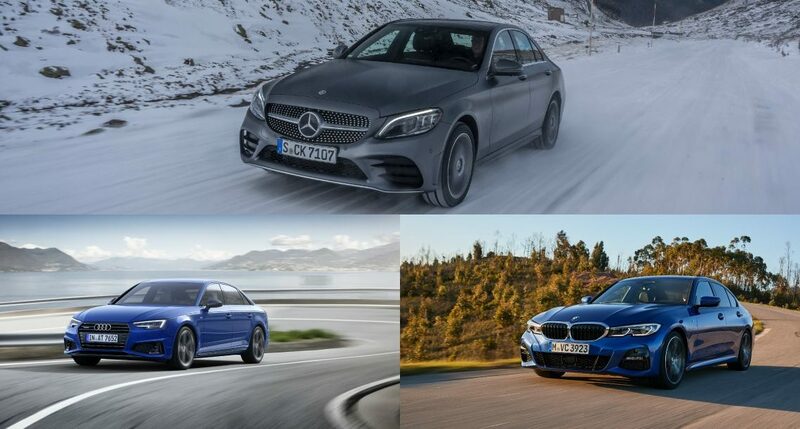 Sales of the world’s most popular premium large sedan increased by 12.7% in 2018 with a total of 328,997 units. 142,617 electrified BMW and Mini were sold in 2018 and the BMW 530e was the best seller among all BMW and Mini Plug-In Hybrid models with 40,260 cars sold (12.2% of global BMW 5 Series sedan). 34,829 BMW i3 were sold, an increase of 10.6% due to the new larger battery. BMW M GmbH division registered a new sales record with more than 100,000 units sold. With 102,780 units sold (+27.2%), BMW M GmbH came closer to Mercedes-AMG, which sold 118,204 cars (-10.4%). The bad surprise came from Audi, which is the only premium brand which registered a decrease in sales with 3.5% at the global level. Dieselgate affected very strong the sales especially in Europe where Audi has decreased with 13.5% mainly because a lot of versions were not available after September 1, 2018. The future looks also bad because in December 2018, Audi sales decreased with 14.3% in the world and 20.9% in Europe. The only region where Audi registered a sales increase was in China. Audi sold last year 663,049 cars in China, which represent an increase of 10.9%. In USA, Audi obtained a result of 223,323 units sold (-1.4%) but is still very far from the BMW and Mercedes-Benz.